There are times when we need to know the wifi password which we once entered in our Windows computer. For example, we need to enter the same password in another device. Or worse, we need the password of the wifi router which we aren’t currently connected to. What if you want to find all the saved Wifi passwords in your Windows computer? There are two ways of finding all the saved Wifi passwords in Windows. Let’s discuss both of them. To see all the Wifi passwords, you will need to run some commands in the command prompt. 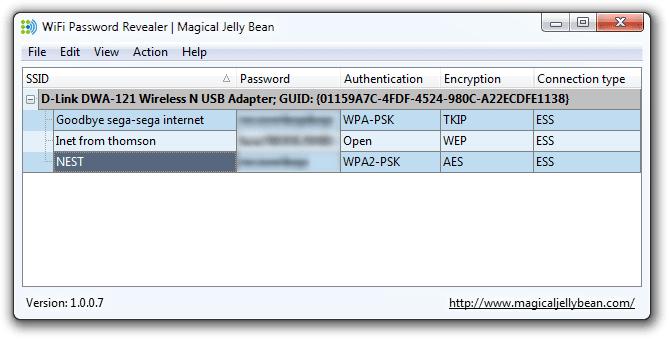 If you are not comfortable with using the Windows command line, you can use third party software called Magical JellyBean Wifi password revealer which will retrieve all the Wifi passwords saved in Windows. You just have to download Wifi password revealer, install and run it. There is no configuration required. You can select any Wifi connection and press Ctrl + Alt + C to copy the password in the clipboard. Please note that if you are using Windows Server 2003 or Windows XP, the actual Wifi password will not be show but it will be shown in HEX form. The same HEX password can be used to activate Wifi on any other device. Thank you so much for the detailed tutorial. I’ve made a simple PowerShell script to make the procedure easier, it will recover wifi passwords in just 3 seconds.